(Photos + Video) Summer Jam 2015 Recap: Performances, Gossip + More! 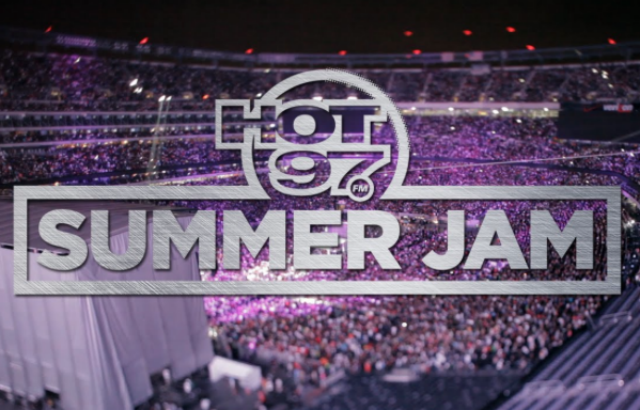 Yesterday marked the 23rd annual Summer Jam concert from Hot 97, and another epic night for the record books! I was frazzled for a majority of the show because I signed up to work, and was assigned to handle all things Fetty Wap and Ty Dolla $ign…which sounded fun in theory, but DAMN it was a lot of work! Needless to say, I missed about 90% of things that happened – and that includes all that drama outside. My mother actually was texting me in a panic making sure I was okay, and I had to ask her what she was talking about because we were calmly sitting around sharing “deez nuts” jokes backstage at the time. LOL! It’s a shame a few bad apples attempted to spoil the whole bunch, but they ultimately didn’t – as the show went on inside without incident, and for the tens of thousands that did get in, it was an amazing time! SO much went on behind-the-scenes and on the stage, so I’ll start from the beginning at the Festival Stage. (Photos) Trouble In Paradise For Ciara & Future? No Ring On Solo Vacations, Mistress Rumors & More! They always say the hottest love has the coldest end. Drake may have hit the nail right on the head with that line, as after Ciara and Future started off red-hot and crazy in love, it seems as though there may be some trouble on the horizon for the pending marriage of these new parents. We can begin with the most obvious fact – the pair haven’t been together very much since the birth of their son in May. Future has been on the road promoting his Honest album the entire time, even performing at a show across the country the same night that baby Future was born. These things happen when you’re in a relationship with an entertainer, so it’s not too much of a red flag, but in the same token – when you want to make time, you do. CiCi made her first major post-pregnancy outing over the weekend on a trip to Ibiza, and not only did Future not come along, but that beautiful engagement ring was noticeably MIA. Never a good sign!